GAIZIUNAI, LITHUANIA - JUNE 18, 2015: Musicians go beside soldiers. 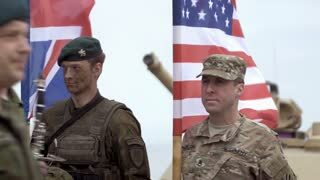 Soldiers hold flags during NATO exercise Saber Strike 2015. Editorial use only.